1). What should come in place of the question mark (?) 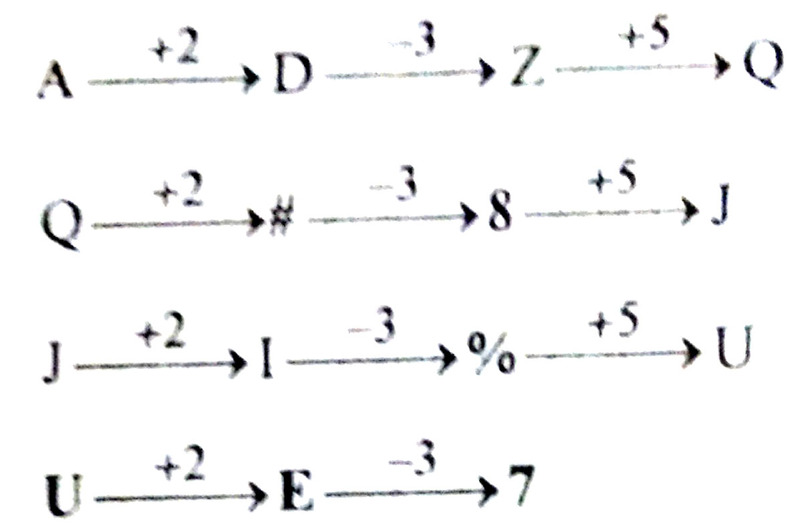 in the following series based on the above arrangement? EPK WG4 DJI 8NU ? 2). Which of the following is fourth to the right of twelfth from the right end of the above arrangement? 3). How many such consonants are there in the above arrangement each of which is immediately preceded by a number but not immediately followed by a consonant? 4). Four of the following five are alike in a certain way based on their positions in the above arrangement and so form a group. Which is the one that does not belong to that group? 5). How many such symbols are there in the above arrangement, each of which is immediately preceded and immediately followed by a consonant? 6). How many such vowels are there in the above arrangement each of which is immediately preceded by a number and immediately followed by a symbol? 7). What should come in place of the question mark (?) 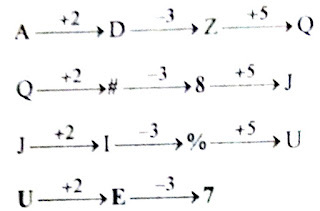 in the following series based on the above arrangement? 8). Which of the following is eight to the right of the eighteenth from the right end of the above arrangement? 9). 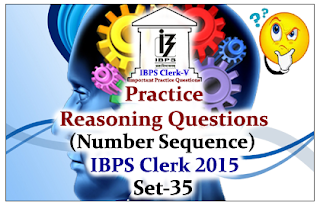 How many such numbers are there in the above arrangement each of which is immediately preceded and immediately followed by a vowel? 10). If in the above arrangement the position of $ and q are interchanged and the position of J and 7 are interchanged, how many vowels will be there, each of which will be both immediately preceded and immediately followed by a consonant? 2.Fourth to the right of twelfth from the right end =(12-4=) 8th from the righ end,ie 6.